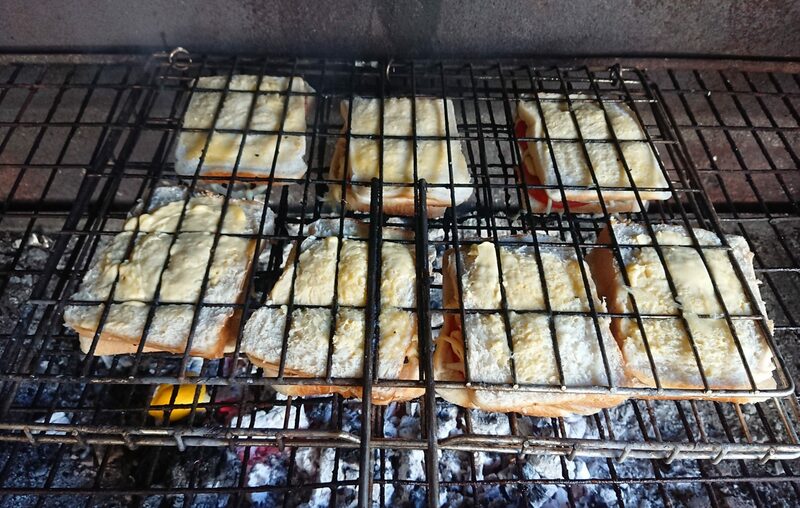 Braaibroodjies, the quintessential element of any decent South African braai. For those of you unfamiliar with this delicacy: kerriesosaties are cubes of skewered meat marinated in a curry sauce, before being cooked on a grill over an open fire. Coals, actually. The fire needs to have died down to some darkly glowing embers before the sosaties may even meet the grill. 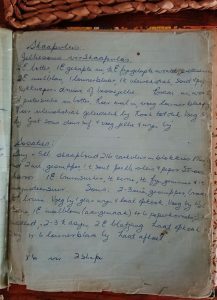 My own dear mother’s champion kerriesosatie recipe gives quantities for 2 sheep. That’s how seriously we took our kerriesosaties back where I came from, I tell ya. And you need to braai them carefully, too: kerriesosaties are not just any old kebab you can fling on the grill and hope for the best. No, no, no – they need tender loving care, close attention and regular turning, so that the outer bits are just a little bit charred, and the inner bits are still nice and juicy. Usually the top braaier would be assigned this task because if you ruined the kerriesosaties, you were off the Christmas card list for LIFE. You might as well leave town, actually. Become a vegan, change your name. Because making kerriesosaties takes time, expertise and a whole lotta love. It’s a laborious task to make kerriesosaties, as it’s imperative that the meat for the sosaties marinates in a pre-cooked curry sauce for several days in advance. A day is pushing it IMHO; a week is perfect. (I grew up in a household where there was always, but always, a tightly sealed Tupperware of kerriesosaties in the fridge, waiting for the Sunday braai.) Now, this meat has to be cubed leg of lamb – not too fatty, but with at least some fat attached – plus half that quantity of cubed pork, also not too fatty, but a l’il, l’il something. If there’s no lamb on your kerriesosatie, you have yourself a kebab. Plain and simple. Oh, and skewered in between the cubes of meat, some softened dried apricots. Maybe a few fresh bayleaves, if you’re fancy or from the Cape, but we Freestaters generally didn’t bother with such frippery. Just the apricots, for the juicy tartness it added to the sosaties. So. 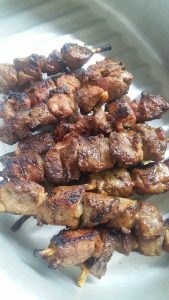 Your cubed lamb and pork would be lightly seasoned, skewered and then gently bathed in your curry sauce, in an airtight container which is placed tenderly inside your refrigerator and left there for the magic to happen while you go about your daily life and start planning the big day of your braai. You can start by ordering beers, brandy and coke for the ouks, Oros for the children, and Nederberg Stein for the womenfolk. My late mom’s famous kerriesosatie recipe is also famously vague, like most of her handwritten recipes. More like annotations and reminders than recipes, she often left out crucial bits like ‘what temperature do I cook this at’ or ‘how long do I cook this for’. What do you make of this, I mean? 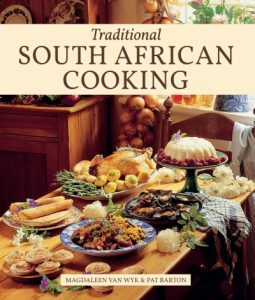 Written by Magdaleen van Wyk and Pat Barton, this is one cookbook which I can certainly recommend as an essential guide to the true taste of traditional South African Cooking. Cut a 5 lb leg of lamb and 2 lb pork into cubes. Mix with two finely chopped onions, 1 t (5ml) salt per lb meat, and ground white pepper to taste. Sprinkle over this mixture 1 T (15ml) brown sugar, 1 t (5ml) curry powder, 1 t (5ml) ground ginger and 1 t (5ml) tartaric acid. Mix well in a large bowl, cover and let stand for an hour or two. SAUCE: cook 2-3 chopped onions until softened in a little oil in a large pot. Add 1 glass (125 ml) of white or sweet white wine and bring to the boil. (Use apple juice or stock instead of alcohol if you prefer.) Mix 1 and a half T (20 ml) curry powder with 1 T (15 ml) cornflour (Maizena) and whisk into the onion sauce until smooth. Turn the heat down low. Add 4-6 peppercorns, 1 t (5 ml) mustard powder, 2-3 cups (500 ml – 750 ml) brown grape vinegar, 4 T (60 ml) Mrs Balls chutney, 4-6 bayleaves and stir well. Let the sauce cool down completely. While sauce is cooling, skewer the meat about 6 cubes to a wooden skewer, and then layer with the curry sauce in an airtight container. Cover tightly and store in refrigerator until needed. Bring meat to room temperature before grilling. My mom’s note to this recipe was: x 6 for 2 sheep. So now you know. Combine all the ingredients for the marinade in a saucepan and add the onion quarters. Bring to the boil and boil for 5 minutes, or until slightly thickened, stirring occasionally. Transfer the marinade to a large dish. Add the pork and lamb cubes and marinade them for 4 hours (or overnight) in a cool place, turning 2-3 times. Soak the apricots in water to cover until plump, then drain. 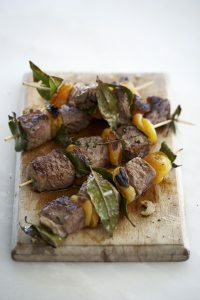 Remove the meat from the marinade and thread it onto skewers alternately with the mutton fat, apricots and onion. Braai the sosaties over moderate coals, or grill in the oven, turning frequently, for 25 minutes, or until cooked. Serve with Crumbly Mealy Porridge. 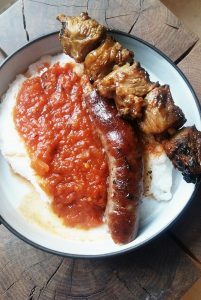 Now while all the above may be entertaining reading, it’s hard work nonetheless to get this deliciousness into your mouth at your next braai.